In this dynamic and versatile market of sweet and salty snacks, BOOTH #398 is a Must See! *With the new generation of millennials and Gen Z shoppers demanding healthy products made with better-for-you ingredients, & transparency when indulging their snacks and sweets cravings, the confectionery industry is committed to helping by offering more transparency, portion guidance, and healthy options. We have a very good reason for you to join us at the Natural Products Expo West 2019! *Sales growth of natural food and beverage products is greatly outpacing sales growth for conventional products at the national level! The same can be said in every region of the United States, according to an analysis of market data by SPINS. 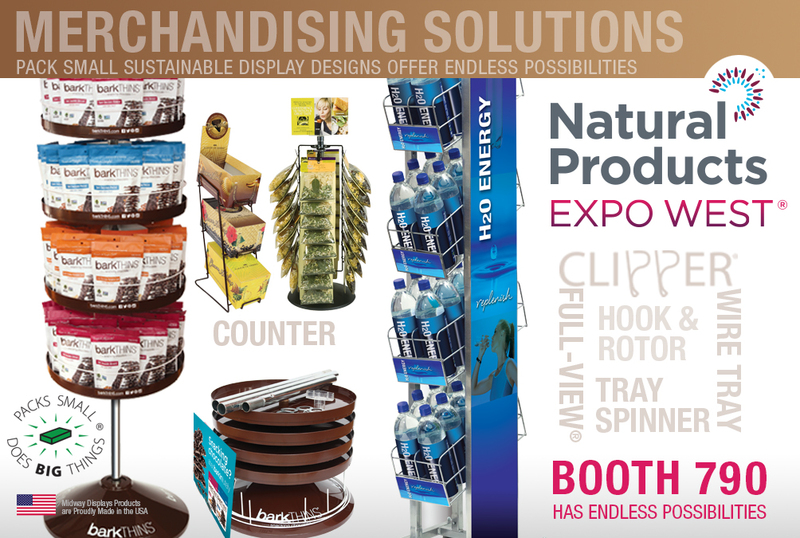 Here at our Midway Displays BOOTH #790, you will find the perfect solution to fulfill your natural product merchandising needs for new product intros and secondary product placement. Select from five categories of presentation component systems that will provide you with a display that best markets your brand and packaging needs. Our In-stock mix and match display components can be cross selected for use with your product whether it’s bagged, tabbed, cartoned, bottled, shrink wrapped or loose! 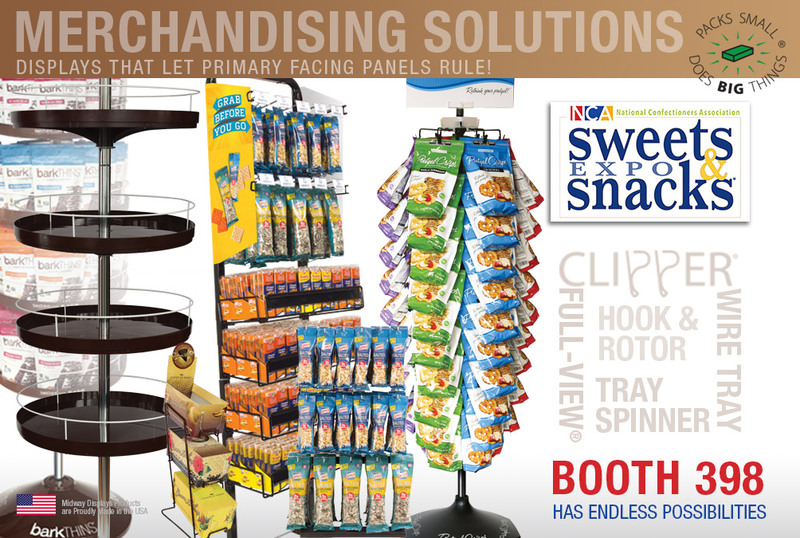 Looking for a point of purchase or off-the-shelf display rack to market your newest sweet, savory or salty product in the super market, c-store, or big box retail setting? Well look no further! 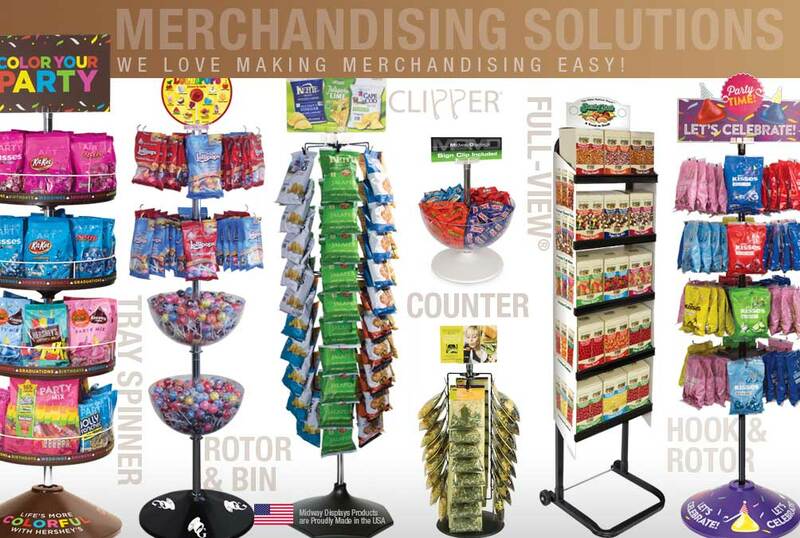 We have been serving the candy and snack industry for over 35 years, and our merchandising component systems have been designed specifically to be your answer to in-store merchandising. We love to make merchandising easy and we understand both retail and brand concerns. We invite you to visit BOOTH 398 where we will assist you in selecting the perfect merchandiser for your tabbed, cartoned, bagged, shrink wrapped, or loose candy and snacks! We offer counter and floor displays, roll-around stock spinners, tray and dump bin displays, full facing stationary & mobile merchandisers, and more.